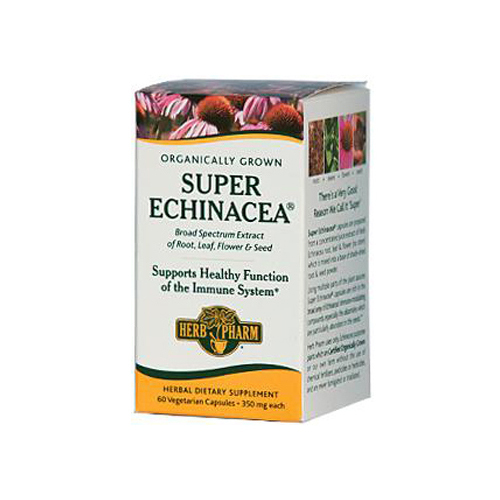 Super Echinacea capsules are prepared from a concentrated juice extract of fresh Echinacea root, leaf and flower (no stem) which is mixed into a base of shade-dried root and seed powder. Using multiple parts of the plan assures Super Echinacea capsules are rich in the broad array of Echinacea's immuno-modulating compounds, especially the alkamides which are particularly abundant in the seeds. Take 1 or 2 capsules, 2 to 5 times per day. Best taken between meals. Servings Per Container: 60 Other Ingredients: Echinacea purpurea (root and seed powder, and dried juice extract of root, leaf and flower), and the vegetarian encapsulating ingredients magnesium stearate and stearic acid. Vegetarian capsules are made only from plant cellulose and water (no gelatin). Warnings Do not take during pregnancy.